I’ve joined hundreds of runs before but nothing like the one last Saturday. It started at 7:30 p.m. What run begins at that primetime, traffic-infested hour, on a Saturday, the busiest of nights? Aren’t all races on an early-morning-Sunday, when everyone’s lying in bed and the roads are asleep? The Color Nite Run was different. It’s a “party” run. By that, I mean this: loud Avicii music, powered by the Party Truck of Nature’s Spring, flooding the open air as laser lights swirled; everybody wore black — but what illuminated the darkness were neon sticks. All runners were given glow sticks. Some wrapped the neon bands on their necks, arms, wrists. I saw pairs of colored shoelaces. A foam stick — which emitted neon glows — was handed each runner. We waved the stick, carried it like a baton on a 400-meter relay; we ran like Darth Vader with lightsabers. 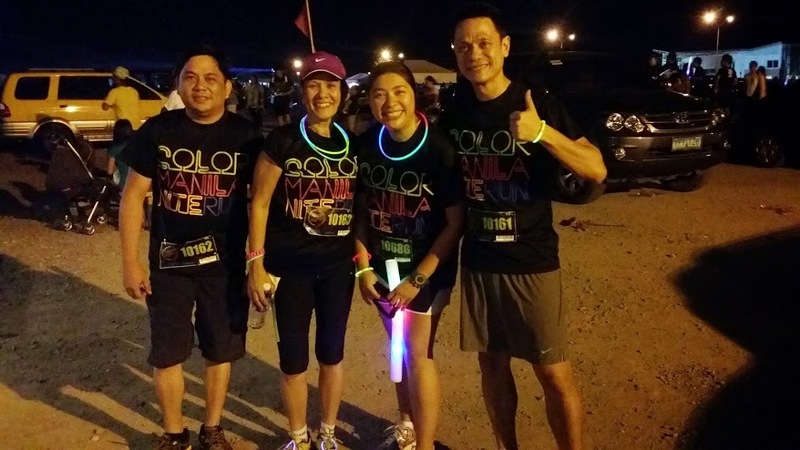 The venue was the South Road Properties (SRP), with the start/finish area at the Il Corso in Filinvest. 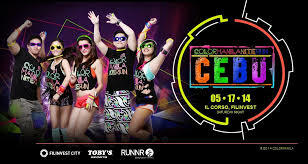 Imagine the sight of 1,800 participants — which included many friends, Lester Tabada, Steve Ferraren, Derek Dytian, DJ Fortz (aka “Michael Jackson”), Allan Delantar, Jeson Guardo — running in the gloom, all carrying yellow bands and orange sticks and glow-in-the-dark accessories? Boom! As the gun was fired to signal the start, we all shuffled our feet and waved our colors to trek 10 kms. Half of the SRP road was closed. Perfect. With the calm waters of the SRP to your right and the vibrant lights of Cebu to the left, how unique could this run be? Looking at the lights of our city, what stood brightest was Crown Regency, all 40 storeys with multi-colored glowing lights that danced and bounced. The run was “cool” — and, at night, cooler than the 36 degrees Celsius of summer sun to bake your skin. Organized by Jay Em of ProactiveSports and assisted by Joel Juarez of Coco Running, these guys are experts. Starting with the registration, after paying you’re given a plastic card. You go online and register. The run was well-managed. Hydration stations were plenty. Signages were clear. Tents stood at the finish with food/water. What I found unique was the fee: it was the same P750 for the 3K, 5K and 10K distances. All got a good-quality black shirt plus the neon adornments. Also, since this was a fun-run, no prize money was involved (which saved the organizers plenty); it also meant that they could deploy fewer marshals at the U-turn slots — if you booked for a 3K but felt strong and wanted to go 10K, why, nobody would stop you. Nice. The only bad parts? Glow Eyeglasses were promised but not given. Worse, no medals were distributed at the finish. For some reason, the medals were locked-up somewhere and they could not be handed-out. This turned many smiling faces into frowns. Personally, the race was extra special because the entire way, I ran alongside a person who bore me in her womb and helped raise me the past few decades: my mom, Maria Elena. Stride for stride, running short bursts then strolling to walk as the water stations approached, my mom Allen and I forged ahead as one. Best of all? It was my mom’s birthday, her 46th! (Okay, you can interchange the numbers but given her looks and slim physique, she can pass as my sister.) We ran. So did dozens of my mom’s relatives: her four brothers, Ric, Eton, Ondoy and Paul; and dozens of my cousins who flew in from Iloilo — including my “older brother” (cousin) Dindin Zaldarriaga who ran the 10K with my wife Jasmin. We also had over 50 of our teachers from Play House and Bright Academy. At Lantaw Native Restaurant, led by my brother Charlie, we set-up a tent with plenty of food. Prior to the gun start, I did something I’ve never done before: I tore a few cracks off the skin and munched on lechon… before a 10K. At the finish, after a leisurely one hour and 19 minutes, my mom and I crossed the line with arms raised, holding hands. Minutes later, fireworks erupted as we sang Happy Birthday. What a colorful night.